Arnold Moss both wrote and performed in several episodes of CBS Radio Mystery Theater. 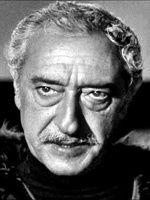 He appeared in the Star Trek episode "The Conscience of the King". His wife, Stella was an accomplished writer. Mr Moss created several NY Times Crossword puzzles. They are the parents of Frank Moss, one of the original writers for Sesame Street and the creator of Cookie Monster. 09/05/1974 0144 Deadline for Death Johnny Promo is a convict sentenced to death. He promises a witness who testified against him that he will meet his death within a month of his own. 09/23/1974 0151 Island of the Lost A middle-aged man travels to an isolated island to surprise his young beloved. But he is afflicted by uncertainty in their relationship and starts doubting himself. 11/07/1974 0171 How Eberhard Won His Wings A virtuous man is blessed with a pair of wings for his spotless conduct and commitment towards good. But both he and his wife think it ridiculous to wear them. They both try to find a sin that he can attempt so they will be taken back. 12/10/1974 0185 The Damned Thing A government official investigates the death of a very rich man an each witnesses narrates the incident differently. The man's best friend informs the coroner that he was murdered by a mysterious, invisible creature of a color invisible to human eyes. 02/10/1975 0221 Journey Into Nowhere An archaeologist discovers an antique which leads him into a confrontation with the goddess of revenge. 04/10/1975 0254 The Death of Halpin Fraser A nightmare journey through purgatory is in order for a man who is beset by the voices of his mother, father-in-law and the former wife whom he had murdered. 04/05/1976 0462 Time Killer Playing with a theory on the fluidity of time, a college professor accidentally transports himself back to the period before the Great Depression. His interference with the time-space continuum alters his future drastically. 06/07/1976 0489 The Corpse that Would Not Die To marry his lover, a man kills her husband despite being his best friend. Soon the weight of both their sins begins to slowly poison their love. 08/26/1976 0510 The Man Who Could Work Miracles As 1899 comes to a close, in the Bowery section of lower Manhattan, George comes to the realization that he can alter events by just willing it to be so. Everything he wishes for comes true. But his power leads to hubris and he goes too far. Will he be able to reverse the course he has set for the world? 11/04/1976 0546 City of the Dead During the late 19th century, two scientists explore the Caybridge Trough in the Carribean to a depth of five miles, one of the deepest parts of the ocean on the planet. They encounter a strange city and a civilization of hostile, man-like creatures who attack them. A snowbound prospector is saved by an Eskimo witch from a fatal accident. He soon learns of her powerful skill with healing magic and decides to marry her. Her talents soon help further his political ambitions. However, bloated with his own self-importance he decides that he no longer needs the savage that is his wife and schemes to get rid of her. 04/04/1977 0628 So Shall Ye Reap In the 1850’s, a small town in New Mexico becomes afflicted with a strange curse that affects only women and children. In a desperate bid to find a cure, the town’s mayor discovers an unspeakable horror from his past. 04/18/1977 0636 A House Divided A son returns home four years after joining the army with a plan of revenge for the murder of his D.A. father who was killed by his mother and her mob-connected lover. 05/06/1977 0647 Bottom of the World Arctic scientists must escape when threatened by a planetary catastrophe. 07/14/1977 0682 A Matter of Conscience A young Kentuckian joins the Union Army, defying his parents who are loyal to the Confederacy. He is immediately sent to spy on a nearby Confederate regiment and meets an unlikely enemy. 08/24/1977 0699 The Adventures of Don Quixote The adventures of the fractured fairy tale of Don Quixote and his misadventures in 15th Century Spain. They are not giants, they are windmills. 11/03/1977 0734 Land of the Living Dead In their journey to a distant village tucked away in the interiors of Brazil, two scientists find themselves stranded at an airport in a mysterious village. A village filled with an ancient people with their strange customs and rituals. 02/24/1978 0788 Loser Take All A young boy seems content to be out-shined by a friend who seems more capable at everything. But he does have a surprise up his sleeve. 06/09/1978 0848 A Long Way from Home Two buddies from Ohio enlist in the Union Army during the Civil War. They agree to stay together and look after each other in battle. But when the fighting gets hot and heavy, one cuts and runs while the other remains, mortally wounded. The consequence of that cowardice is dire. 11/20/1978 0920 The Thing at Nolan When a father vanishes while digging a ditch in frontier Missouri, suspicions fall on the rebellious son who recently threatened him with bodily harm. His mother believes his claims of innocence, but the rest of the townsfolk do not. 01/15/1979 0945 The Long, Long Sleep When his doctor informs him that he needs open heart surgery to prolong his life, a man becomes despondent. Soon after, he experiences a strange situation in which he believes is is already dead. This convinces him that death is just around the corner. 09/10/1980 1117 Ocean of Emptiness On a mission to scout the planet Jupiter, a married couple on their first trip in space find themselves being followed by an unknown thing. When they receive a disturbing report announcing their deaths, they return to Earth and discover just how much the world has changed during their absence. 09/14/1981 1242 Flower of Evil A mail-order-bride learns is met by a father and son tandem. When it is revealed that she is to be married to the grizzled old prospector instead of his strapping young son, chaos ensues. 11/16/1981 1260 Death Will Not Silence Me A recounting of the tragic life of former First Lady, Mary Todd Lincoln as she struggled with the loss of her husband and two young sons; as well as the devils that plagued her. 03/29/1982 1308 On the Night of the Dead In a village ravaged by sickness and hunger, a group of women pin their hopes for salvation on a man claiming to be a god. Meanwhile, their cynical leader demands proof of his powers. 05/21/1982 1331 The Different People An anthropologist stumbles across a letter written during the Civil War indicating that a group of veterans may have discovered the secret of immortality. In order to validate the information, he tries to locate the whereabouts of the soldiers named in the missive. 08/10/1982 1359 A Pair of Green Eyes Murder, mayhem and a lost jewel become the main clues to uncover the truth behind an archaeologist's death. 09/27/1982 1374 Roll Call of the Dead Despite repeated warnings from their Apache tour guide, East Coast college students explore a dangerous route during their tour of the Wild West. As they press forward, Clark and Jimmy meet members of an old exploration team that mysteriously vanished.